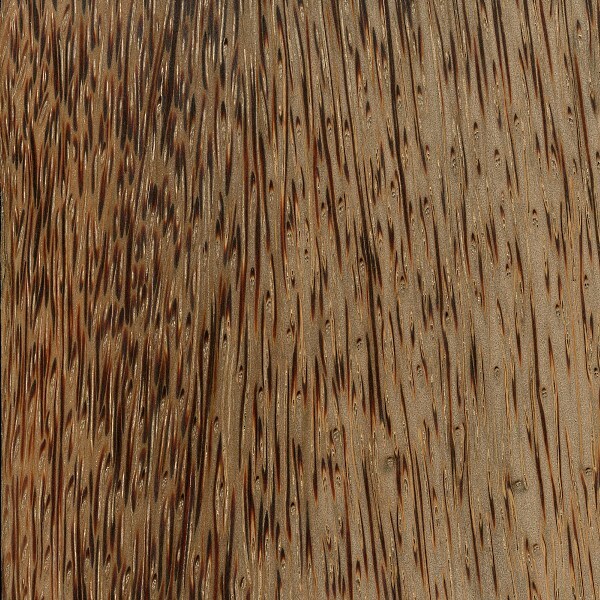 Grain/Texture: Red Palm has a medium to fine texture, though it is by no means even or uniform on account of the contrast between the dense, darker fibers, and the soft, lighter cellulose structure of the wood. 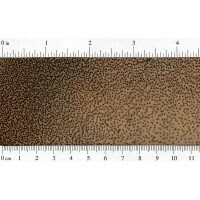 Grain is very straight, and contains no growth rings, knots, or defects. 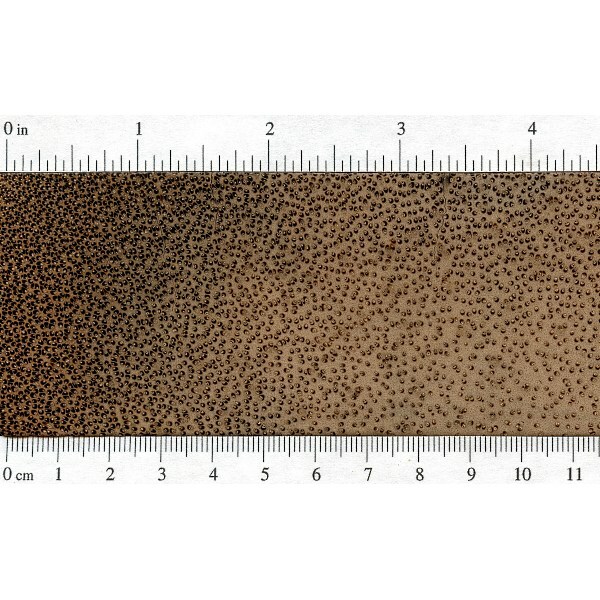 Endgrain: Being a monocot, endgrain characteristics are non-typical when compared to more familiar hardwood dicots. 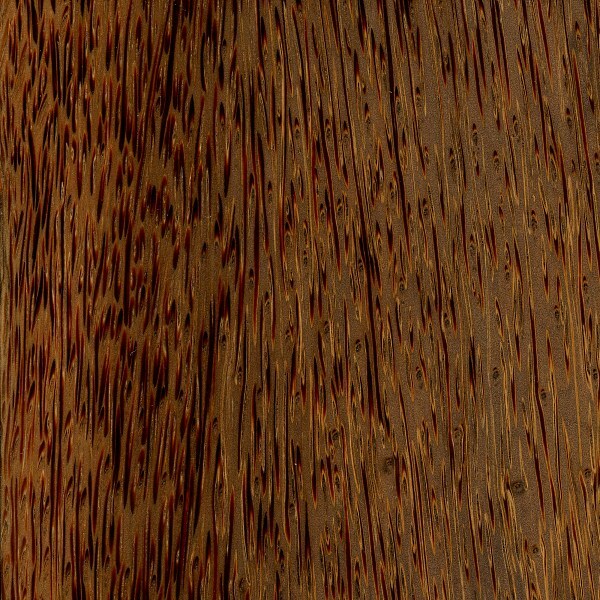 Red Palm has a uniform distribution of reddish brown fibers embedded in a softer yellow/brown body of parenchyma. Growth rings, sapwood, and rays are completely absent. 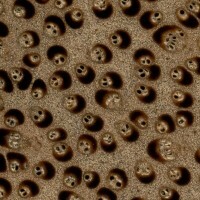 Endgrain exhibits a dotted pattern unique to palm trees. Rot Resistance: Red Palm is reported to be durable regarding decay resistance, though it is susceptible to insect attacks. Workability: Tends to be quite difficult to work with both machine and hand tools. The hard fibers contrast with the soft body of the wood, and can be brittle and splinter or pull out. Very sharp tools and correct cutting angles are required to get clean results. Applying a hardener or sanding sealer prior to final sanding/machining may help give a more homogenous density and reduce tearout. The lighter colored body of the wood tends to absorb larger quantities of finish, so care must be taken during finishing; a sanding sealer is recommended. Allergies/Toxicity: Palms in the Arecaceae family have been reported to cause skin irritation, and general constitutional effects. See the articles Wood Allergies and Toxicity and Wood Dust Safety for more information. 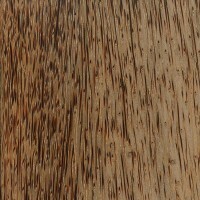 Pricing/Availability: Although Red Palm trees can get up to one foot across, the center of the trunk is filled with a soft, unfigured portion, with only the outer areas of the trunk containing the characteristic colored fibers, so only narrow boards and spindle-stock are normally available. 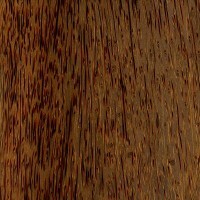 Prices for most sizes of Red Palm should be in the moderate range for an imported tropical wood. Common Uses: Flooring, canoes, rafts, walking sticks, knife and tool handles, carvings, rafters, furniture, and turned objects. Comments: Red Palm is more commonly known outside of the woodworking community as Coconut Palm, where it is cultivated and grown throughout the tropics worldwide for its fruit. Nearly every part of the tree is said to have a use or value, and older trees are typically only harvested for wood after they have passed their time of fruit-bearing—usually after 50-70 years. Technically neither a softwood nor a hardwood, palm falls into the category of monocots, which also includes bamboo, grass, banana, rice, wheat, corn, etc. (Monocot is short for monocotyledon, which simply means that the seed of the plant contains one leaf, rather than two as found in dicots.) Palm woods have no growth rings, and as a result, the shrinkage rate for drying the wood is more or less uniform between the radial and tangential surfaces, resulting in a T/R ratio of 1.0 and good dimensional stability. Red Palm is highly variable in weight, strength, and hardness properties because the wood is so non-homogenous: the trunk is a gradient between the strong fibrovascular bundles, and the softer cellulose structure. Toward the outer wall of the trunk, the density of the wood is the greatest, and gradually becomes lighter, softer, and weaker towards the soft core. Because of this great variability, the density of Red Palm can range from less than 25 lbs/ft3 (400 kg/m3), to nearly 62 lbs/ft3 (1000 kg/m3). A quick visual inspection of prospective wood blanks can help screen out undesired pieces: darker wood usually has a denser packing of fibers, and tends to produce heavier, stronger, and harder material. Thank You your information on wood is always of great information and correct. Red Palm end grain looks like ghostly Bob Ross. That is one funny looking end grain.